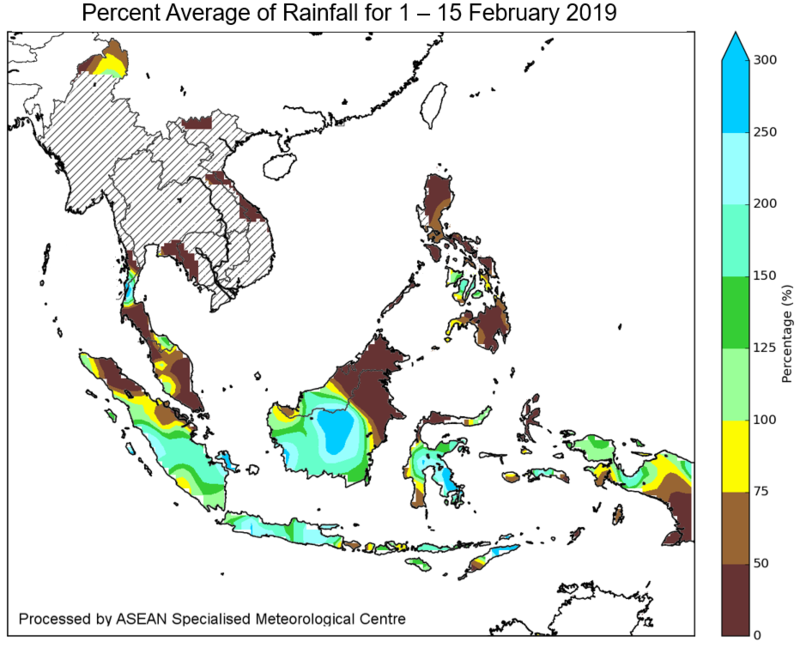 1.1 Northeast Monsoon conditions prevailed over the ASEAN region during the first fortnight of February 2019. 1.2 The Mekong sub-region continued to experience dry conditions, which is typical over the region during this period. The dry conditions were exacerbated by the influence of an extensive dry air mass over the northern ASEAN region. Pockets of drier than usual conditions were observed mainly over parts of Viet Nam, and the eastern and southern parts of Thailand. The Philippines also observed below-average rainfall due to the influence of the dry air mass. 1.3 In the southern ASEAN region, scattered showers fell over most parts of the region. 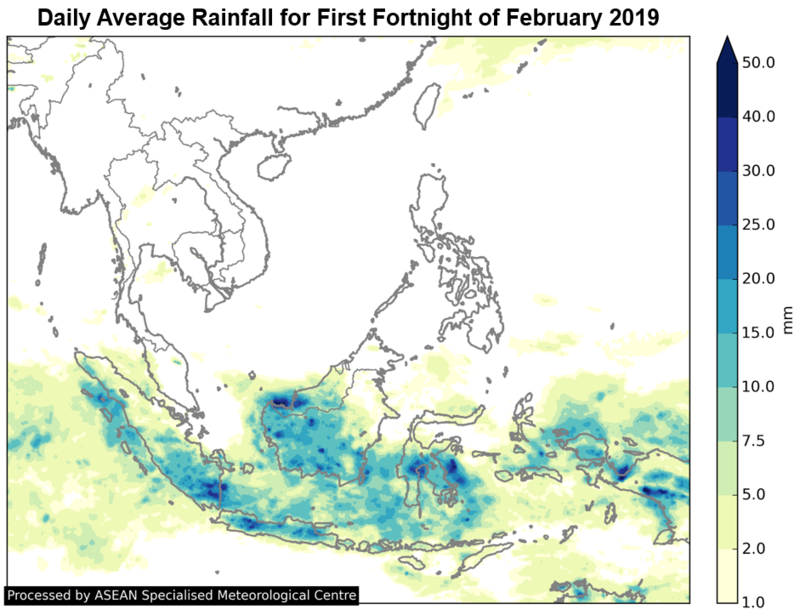 However, well below-average rainfall was recorded around the equatorial region over northern Sumatra, East Kalimantan, Singapore and most parts of Malaysia. This drier than normal conditions were partly due to the southward extension of the dry air mass from the northern ASEAN region. Elsewhere in the southern ASEAN region, above-average rainfall was observed. 1.4 The rainfall distribution and the percent of average rainfall for the first fortnight of February 2019 are shown in Figure 1 and 2. 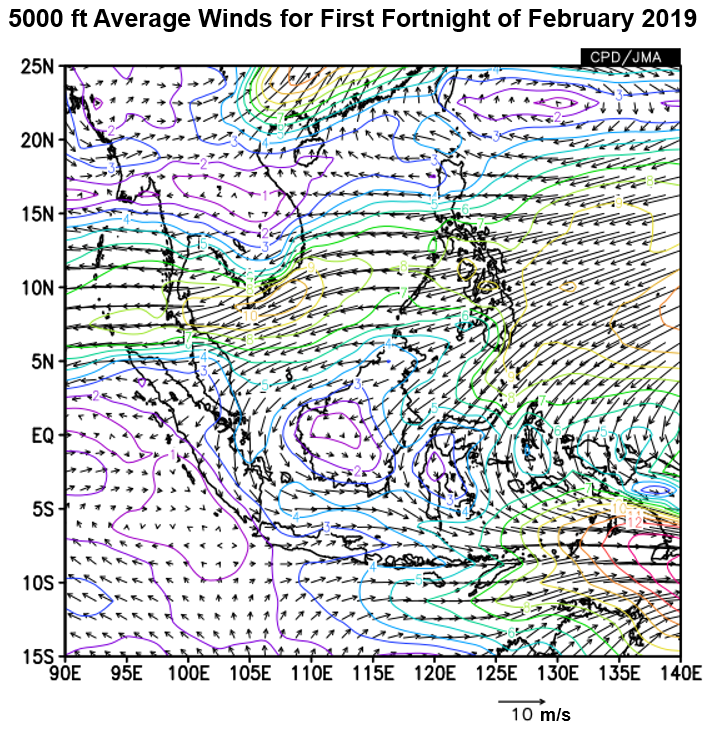 1.5 During the fortnight, prevailing winds in the northern ASEAN region were generally blowing from the northeast or east, except for Myanmar where the winds were from the southwest or west. 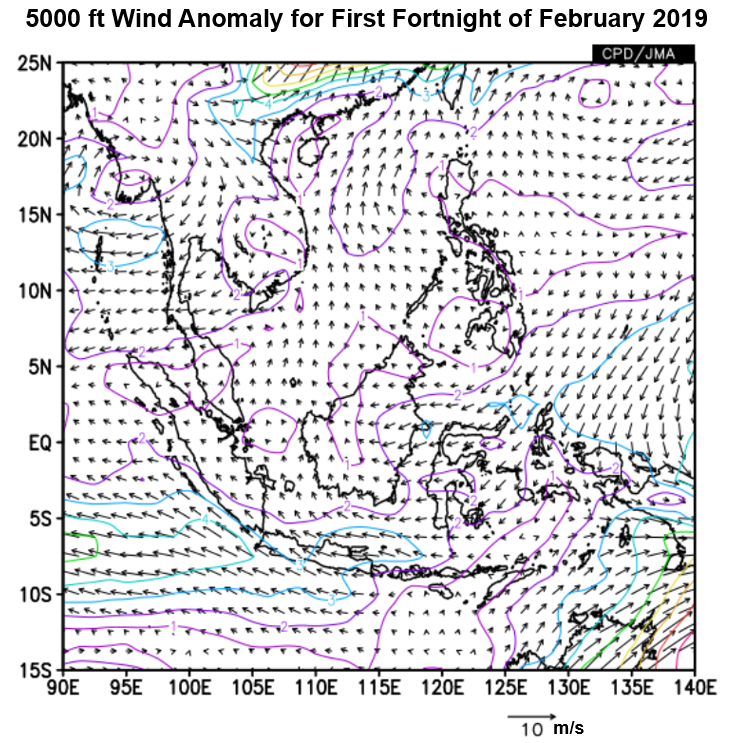 In the southern ASEAN region, westerly or northwesterly winds prevailed, except for the region west of southern Sumatra where southeasterly anomalies were observed. 1.6 The El Niño Southern Oscillation (ENSO) continued to remain neutral (neither El Niño nor La Niña). However, the sea surface temperatures (SSTs) over the tropical Pacific Ocean was observed to have warmed slightly during the fortnight, aided by the westerly wind anomalies in the presence of the MJO. Consequently, trade winds in the western Pacific Ocean were also observed to have weaken. 1.7 During the fortnight, the MJO propagated through Phase 7 – 8. The MJO in Phases 7 and 8 usually brings drier conditions over most parts of the southern ASEAN region and equatorial South China Sea. During this period, the MJO might have contributed to the drier conditions over the equatorial region.